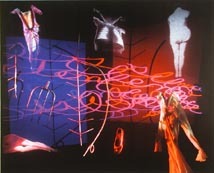 Since the early 1980s, Jane Calvin has been developing a style of imagery that combines slide projections and physical objects. 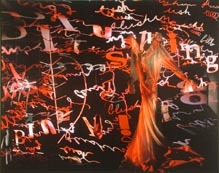 Text found in pulp novels or children’s books, words and letters written out in Calvin’s own hand, or a selection of images and x-rays layer over an assortment of women’s clothing, doll parts, and miscellaneous items that seem to float in isolation against a void or else mesh into the complicated fabric of a heavy curtain. The work in this portfolio highlights a variety of concurrent projects from the late 1990s, touching on recurring themes like silence and elements like vintage dresses, each with Calvin’s signature combination of vivid color and inky black. Jane Calvin was born in Chicago in 1938. She received her MFA in photography from the School of the Art Institute of Chicago (1982) and her BA from Bryn Mawr College (1959). She is the recipient of an NEA Visual Artist Fellowship, an NEA Regional Visual Artist Fellowship, and seven Illinois Arts Council grants. 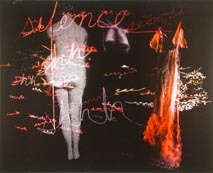 Her work was recently exhibited at 798 Photo Gallery, Beijing, and is included in the permanent collections of the Art Institute of Chicago, Polaroid International Collection, Detroit Institute of Arts, Minneapolis Institute of Arts, and Illinois State Museum, among other public and private collections. She has been an adjunct instructor in the photography department at Columbia College Chicago since 1988.